Though I’ve been back in Scotland for over a week now to begin training for the Guide’s winter test, the last two days are the first of the ‘winter’ conditions that I’ve seen. The wind has been unrelenting for the last week, but only in the last few days has the temperature dropped enough for the precipitation to fall out white. Winter is back up and running! 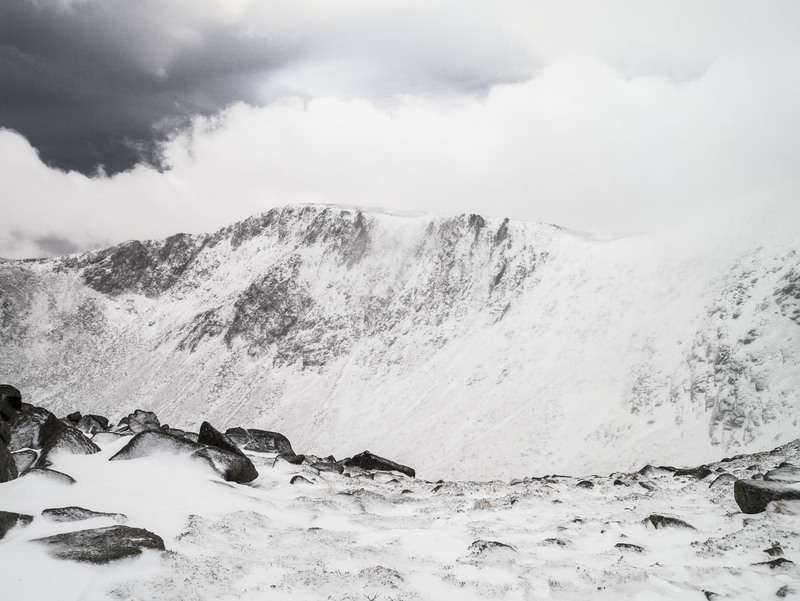 Walking into Coire an t-Sneachda. 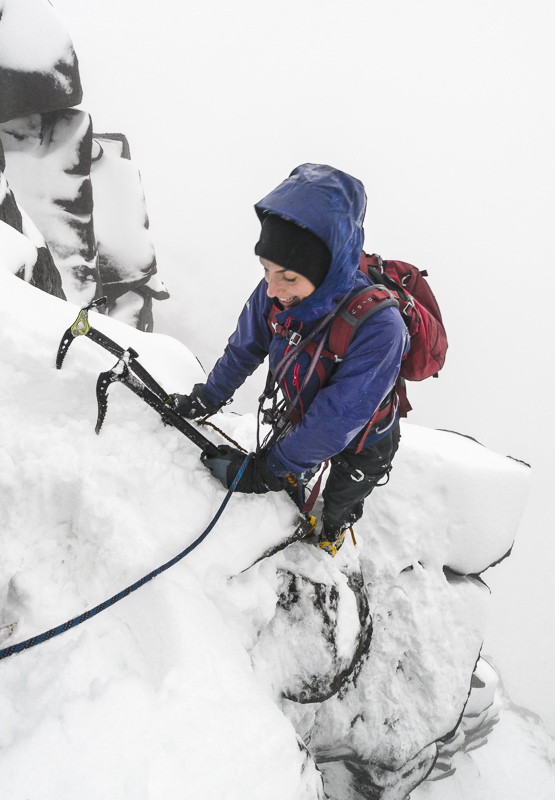 This week Naomi has come up from London for an intro to winter climbing with a view to progressing to Alpine climbing. We have been up in Coire an t-Sneachda for two days. 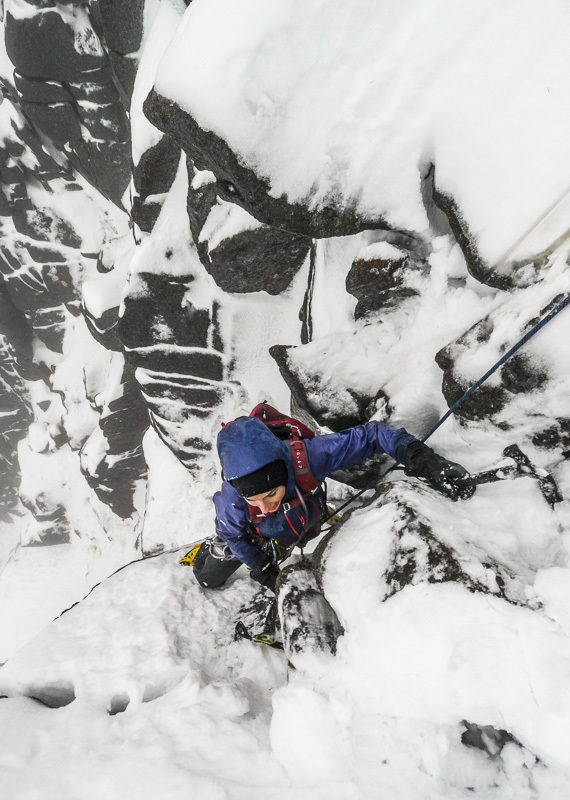 Conditions, though lean, are ample for some mixed climbing. Naomi had never worn crampons before so we started up the ‘Twin Ribs’ that offer a variety of options less or more technical. 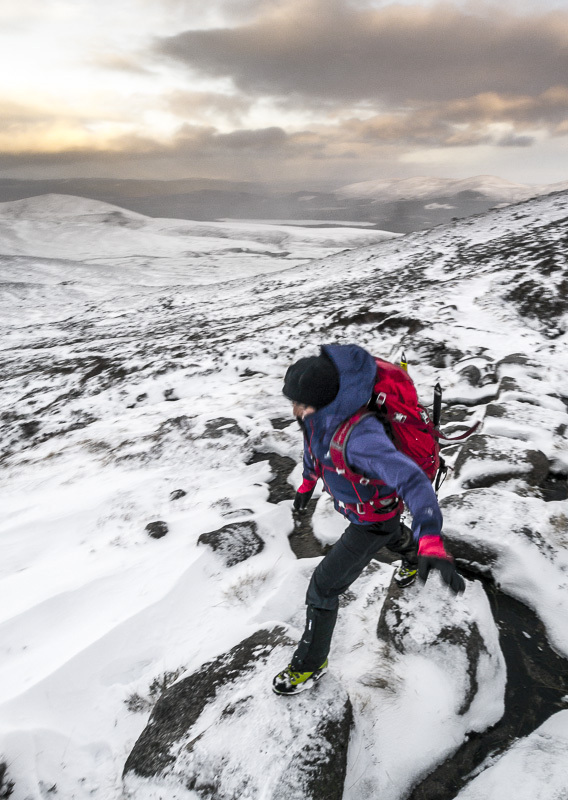 As Naomi adapted quickly to crampons we took the most direct line, then moved up and along Fiacaill ridge to the plateau. The weather was reasonable on Tuesday, though the wind was strong and gusty, arousing a lot of spindrift and regularly impeding progress. Thankfully the temperatures were a few degrees below freezing and so we stayed dry all day. Not so today which was both windier, precipitating, and just above freezing. 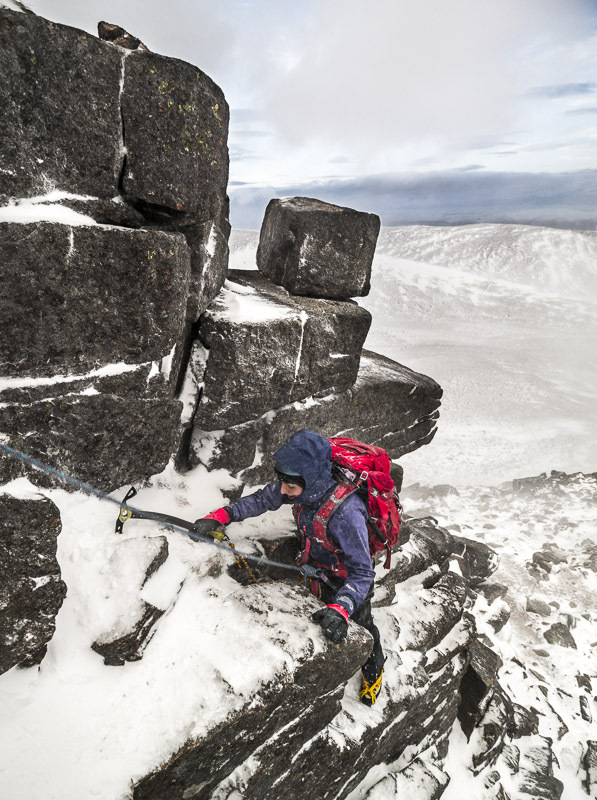 After a good technical progression yesterday we were looking for something a little more tricky, but not particularly long as with challenging weather there is already a lot to manage when new to winter mountaineering! Given the dampness and lean conditions route choices were also fairly limited, though a route on the Mess of Potage seemed a good option. A variation on Hidden Chimney. There were a few other parties of climbers about the Corrie, and another party was ahead of us on Hidden Chimney. However the traversing start and varied terrain either side of the easiest ‘Chimney’ finish allowed us to find some interesting terrain and yet keep out of the fall line of the other climbers. Despite the heavy rain that had fallen overnight there was still a good snow all over the buttresses, and the turf remained largely frozen. The rock was wet though and through the day I soaked three sets of gloves! Mixed Rib to finish. Two DMM ‘Raptors’ – the old and the new. Amazing stuff from the Nomi!